Winchester Bells or Allahu Akhbar? 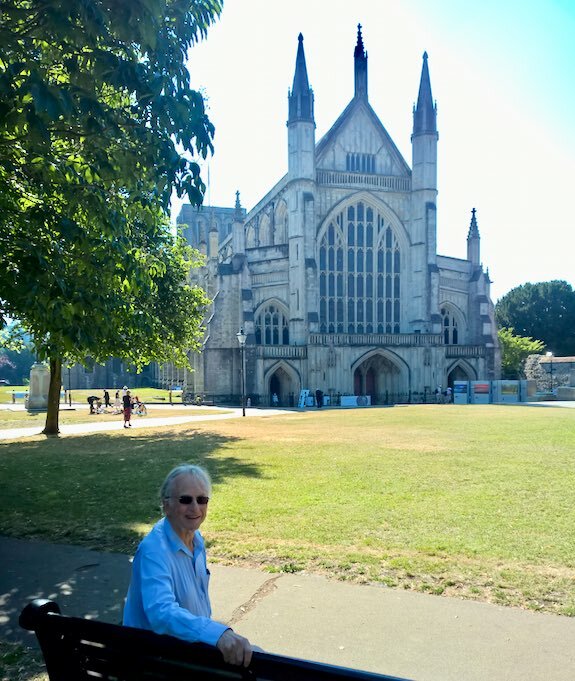 ‘Listening to the lovely bells of Winchester, one of our great mediaeval cathedrals. Following Richard Dawkins’ Monday tweet (above), the Islamists and their slathering Western running dogs are on the outrage warpath again. Once again we have Muslims and their joyless MTP (Multiculture Thought Police) allies out to shut down and destroy everyone like Dawkins that even hints that Islam might just be a crock of sh*t after all. For probably the most rational man on the planet to even think that Winchester church bells are pleasant to listen to is outrageously racist and Islamophobic in the first place. But the thought that these bells might be more pleasant to listen to than to the excruciatingly medieval-ravings of some Muzzie muezzin maniac in a minaret somewhere, amounts to a thought-crime of the highest order. So there is only one thing left to do: shut him down. Dawkins and his rational remarks are totally Islamophobic, and he needs to be removed from the public discourse immediately. Much to the MTP’s dismay, yesterday in The Independent Richard Dawkins proffered more evidence to support the ‘Crock of Sh*t’ argument. Further putting at risk the future of the Left’s STASI-inspired political straight-jacket, Dawkins had the audacity to remind everyone that ‘Allahu akbar’ is also ‘the last thing you hear before the suicide bomb goes off’’. This was really beyond the pale. A deviation of this magnitude from the agreed PC-script (i.e., defiantly publishing observable facts) by one of their favourite sons was always going to trigger an enormous hissy-fit from the Muslim-Leftist axis. Besides, on reading this tweet from one of their favourite, ideologically-sound pin-up boys, the demoralising effect on the millions of moral-equivalency Polyannas world-wide would be incalculable. The realisation might suddenly dawn on all these feather-brained luvvies (who have long swallowed the MTP’s line and enthusiastically supported the large trash intakes) … The sobering realistion that Islam and mass-slaughter are compatible and all that’s needed to make it so is to give Allah a great rap a second or so before you push the button … then off you go! This might be just too much to bear. Dawkins’ Independent remarks again provoked the usual, brainless Muslim advocates out there to launch into the predictable hysteria and brainless name-calling. All they could do, though, is brainlessly accuse Dawkins of bigotry, Islamophobia etc, because – brainless-idiots that they are – when it comes to defending the indefensible, that’s all the arguments they’ve got. Because, let’s face it, if they exclusively own the rap, the following bang belongs to them too. A final thought. Are we seeing the first signs of a U-turn, a return to Jesus moment for Dawkins? Probably not. *Sarcasm, or not – you be the judge. This entry was posted in Islam, Islamophobia, Multi-culture Thought Police (MTP), Muslims, Richard Dawkins, The Left, Winchester Cathedral and tagged Islam, Islamophobia, Muslim Thought Police, Muslims, racism, Richard Dawkins, The Left. Bookmark the permalink.